For Brittany Tessier, Saturday night was all about celebrating her boyfriend Brian Harris' birthday. "I got a suite, we invited his best friend and his wife," said Tessier. Harris' friend had even coordinated a birthday message for Brian, which would air on the Knight Tron between the second and third periods. Tessier's job was to keep him in his seat during intermission. "And he was like, 'okay, I gotta go to the bathroom' and I'm like, 'oh my gosh, it's going to come on right now, what are we going to do?'" Tessier said. But as it turns out, Harris was ready to flip the script. As Harris and Tessier were waiting for the "Happy birthday, Brian" message to appear, a proposal appeared instead. On the Knight Tron, Brian's question appeared. "Brittany Tessier - Will you marry me? Brian." When Tessier looked over, Harris was on one knee. "I don't even know if I said yes right away, I just shoved the ring on my finger," said Tessier, laughing. For both Harris and Tessier, it was a perfect moment. "It could not have been better," said Tessier. For a couple so full of joy and love, it's hard to believe their relationship began in shared grief. In 2015, two months apart, Tessier lost her ex-husband to pancreatic cancer and Harris lost his ex-wife in a car accident. Harris brought an estate form into a bank to be notarized. Tessier was his notary. They connected immediately. "I just say, 'hey, would you be interested in meeting up outside of work to just talk a little bit,'" said Harris. "I need someone to talk to. She looked like she needed someone to talk to." Harris and Tessier believe their love was meant to be. "We got each other through a rough patch that maybe we would've never gotten out of if we hadn't met each other that day." 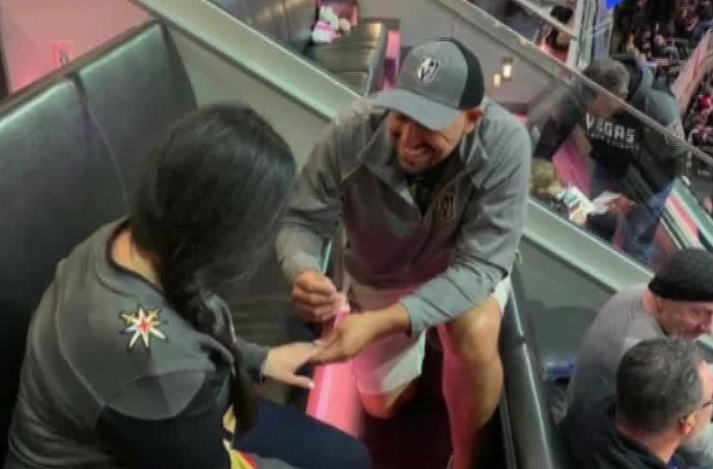 Although Harris and Tessier are in the early stages of wedding planning, they said they plan to get married next October and use Golden Knights gold as one of their wedding colors.